I’ve got just what you need for your long weekend – our member survey report! We’ve spent the last three weeks going over your feedback and discussing it as a team. The attached report represents our thoughts on your goals as well as our feedback on your feedback. I’m really proud of our staff for the work they put into this, and we’re excited about implementing improvements based on your input! So, crack open an ice-cold LaCroix and enjoy this fun read by the pool this weekend. Cheers! No class on Monday – Adios summer. Hello football season. Bravo working people. No FitWit. Enjoy your day off from FitWit and we’ll do the same! We’ll be back in action with our regular schedule on Tuesday 9/4. BUT, 5 am class on Tuesday – Because we’re closed Monday, we’re going to do a 5 am class on Tuesday as well next week. This is just for next week. Ethan on vacation – Coach Ethan is taking a well-deserved vacation from today until Sept 12. Please don’t call him or text him or Instagram him or Facebook him while he’s away. The man needs some rest. Monthly Challenges – Our KB swing challenge is swinging on out the door. Put your name on the board if you complete this before tomorrow. September challenge: how about some pull-ups, ya’ll? Many of you tell us that you want to be able to perform a pull-up. And, the truth is that it takes a good bit of work outside of your FitWit workouts. So, if you are serious about getting your first pull up or improving your pull up, this is the challenge for you! 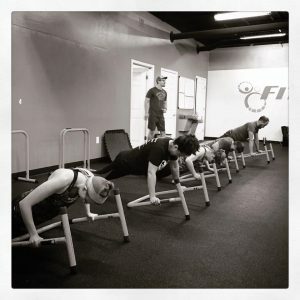 1-minute active hang from a bar. This means keeping your shoulders pulled into their sockets. This is important because it’s going to prepare all the muscles of your shoulder girdle that will later help you pull yourself up while strengthening your grip. If can not complete Pull Ups 3×5 TRX Pull Up. Rest as needed to keep good form (At least 1 Minute Between Sets). If you can complete 5+ Unbroken Strict Pull Ups: 3 Sets of Max Reps Rest as needed to keep good form (At least 1 Minute Between Sets). 3 Sets of 5 Negatives Rest as needed to keep good form (At least 1 Minute Between Sets) . September 23 Social – We’re doing a Sunday picnic at Bessie Branham Park on Sept 23. Bring a lunch, a kickball, football, basketball, kids, dogs and whatever else you need to have a good time. 11:30 – 1:30 pm. Fat loss or muscle gain goal? – If you have a fat loss or muscle gain goal, the InBody test will give you some valuable data to help you refine your plan and maximize success. All FitWit members save a little cash too by signing up here with the coupon codes can be found in your weekly news email.